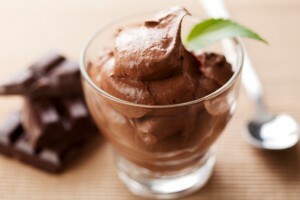 Making Chocolate Mousse is Easier than You Think! Looking for a delicious, elegant dessert for your mother this Mother’s Day – but one that isn’t going to take hours to prepare? Then look no further than this chocolate mousse recipe. Light, delectable and made using just four simple ingredients, this mousse is the perfect ending to a Mother’s Day meal. You can find all the ingredients you need to prepare it right at Charlie Johns in Speculator, too. Beat eggs and sugar with an electric mixer for 3 minutes. While eggs and sugar are mixing, heat 1 cup of the heavy whipping cream in a saucepan until hot. Do not bring to a boil. With your mixer on low, slowly add the hot cream to the egg mixture slowly until combined. Add egg and cream mixture back into saucepan and stir over low heat, constantly, until thickened. Do not bring to a boil. Remove the thickened mixture from the heat and stir in chocolate chips until they are melted. Cover and place in refrigerator for 2 hours, until the mixture is chilled. Stir mixture occasionally. Once the mixture has fully chilled and is firm, whisk the remaining heavy cream with your mixer until stiff peaks form. Take the chocolate mixture out of the refrigerator and fold the whipped heavy cream unto the mixture until it is fully incorporated and the mixture is smooth. Pipe mixture into small serving dishes or goblets. Top with your mom’s favorite – sprinkles, crushed chocolate cream sandwich cookies, mini chocolate chips, or mini candy pieces. Refrigerate until ready to serve. Plan your entire Mother’s Day meal with Charlie Johns. When you visit us, you’ll find everything you need for a delicious dinner that shows your mom you care. From quality meats and fresh produce to our full-service deli and bakery department, you’ll find just the right products to make Mom’s day special.